It's been a relentless summer in Sydney so I like to have on hand a few substantial salads that I can put together quickly, with leftovers that will survive being taken to school and work the next day. 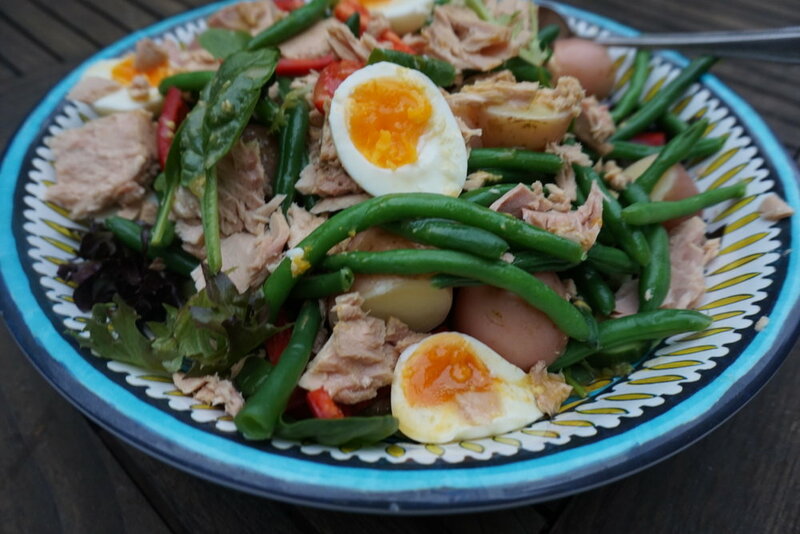 Nicoise salad is cheap, filling and super healthy. Here's my recipe - you can vary the recipe with veggies that you know your family will eat. The tuna and eggs both provide heart healthy omega-3 essential fatty acids and are a great source of lean protein. The salad also features loads of veggies which are filling, are full of antioxidants and fibre. The cooked and cooled potatoes are a great source of resistant starch to nourish your gut bacteria. This recipe is gluten free, lactose free and I've given the small adjustments needed to make it FOODMAP friendly. Dressing made from 2 tbs olive oil, 2 tbs red wine vinegar, 1 tsp Dijon mustard and a crushed garlic clove whisked together (remove garlic before serving). 2. Cook the new potatoes for 8-10 minutes in boiling water, add beans for last 3 minutes. Drain and refresh under cold water. 3. Add egg, potatoes and beans to salad. Top with dressing. Serves 4. I usually cook an extra egg, potatoes and beans so I have an easy work lunch for the next day. If you like the look of this recipe check out my popular 6 week nutrition program - I support you establish healthy eating habits with plenty of easy, family friendly recipes.